Around 400 people donned horse heads, feather tiaras and all manner of absurd headgear in roasting temperatures in Nørrebro on August 4 to protest against the government’s ban on face veils such as burqas or niqabs, which had become law three days earlier. The protestors deemed the law absurd – not only does it invade civil liberties, they argued, but it also bans people from wearing face masks and false beards. Together the participants marched to Bellahøj, shouting slogans such as “Ingen racister i vores gader” (“No racists on our streets”). And there was also a demonstration in Aarhus. Elsewhere, Foreningen For Frihed staged a counter-demonstration at Israels Plads in the city centre, where Dansk Folkeparti’s immigration and integration spokesperson, Martin Henriksen, addressed those present. Henriksen received a gift from the organisation for his troubles: a “satirical” drawing depicting a Muslim woman wearing a niqab who following the ban is rendered naked. According to DR, there were approximately 50 people in attendance, including a Muslim woman who told the broadcaster that “it is nowhere stated in the Koran that women should wear burqas or niqabs”. Already by the time of the demonstrations, a 28-year-old woman had become the first person in the country to be charged with breaching the ban. She was fined 1,000 kroner in Hørsholm, north of Copenhagen, for wearing a niqab. 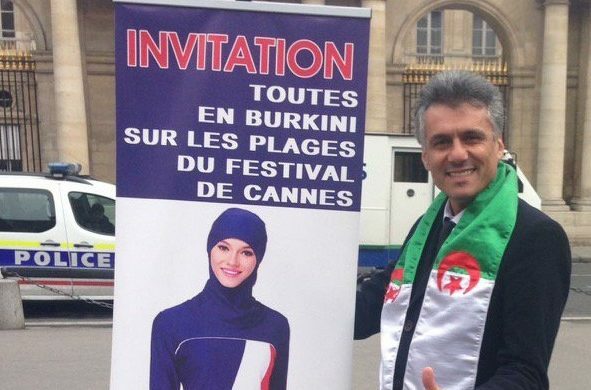 Fortunately, a wealthy French-Algerian businessman, Rachid Nekkaz, has announced he will pay all the fines, just like he has done in Belgium, Switzerland, the Netherlands, France and Germany. Earlier this year, he said he had paid 1,538 so far, and he intends to visit Copenhagen on September 11 to pay all the fines – which vary from 1,000 kroner for the first few offences to 10,000 for repeat offenders. Back in July, Ekstra Bladet said it had found a loophole in the law – namely the wording that “excluded from the ban is the covering of the face that serves a legitimate purpose”. The tabloid has interpreted this to mean that events such as a masquerade ball would be a legitimate purpose to cover your face, and accordingly it has decided to launch the world’s longest masquerade ball as a Facebook event, for which people only need to click ‘attending’ to be exempt. But then he lowered the tone somewhat by comparing the wearers to letterboxes and bank robbers. In other news related to the Muslim community over the summer, it has been announced that from the 2019-20 school year it will be obligatory for pupils aged 5-7 in schools with more than 30 percent of their intake from ‘ghetto’ areas to take a language test. The annual 2016 Global Muslim Travel Index compiled by halal travel authority CrescentRating, in co-operation with Mastercard, revealed that Denmark ranked a lowly 72nd out of 130 nations, but ahead of neighbours Sweden (ranked 75), Norway (77) and Finland (97). Polygamy is still being practised under the radar by some Muslims, according to Fakti, a group that works with refugees and immigrant women, which has come across 30 instances. And finally, an imam at the Masjid Al-Faruq Mosque in Nørrebro has become the first person to be charged with applauding the killing of Jews – under a new law that came into effect on 1 January 2017. He faces a prison sentence of up to three years.